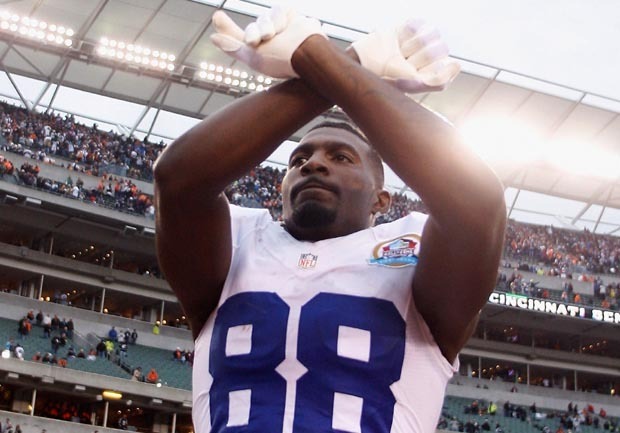 IRVING, Texas The Dallas Cowboys might be without wide receiver Dez Bryant for their playoff push. According to CBSSports.com reporter and DallasCowboys.com writer Nick Eatman, Bryant is set to visit a hand specialist and could require surgery on his finger that would ultimately be season-ending. Meanwhile, team officials are "all-but set'' to concede that top receiver Dez Bryant's season may be over due to a left index finger injury sustained Sunday in the team's emotional 20-19 victory at Cincinnati, team sources tell CBS radio station 105.3 The Fan in Dallas. Bryant injured his left index finger in an emotional 20-19 victory over Cincinnati on Sunday, one day after practice squad linebacker Jerry Brown was killed in a car accident that landed defensive tackle Josh Brent in jail on intoxication manslaughter charges. Dallas coach Jason Garrett said Monday that Bryant was still being evaluated. The Cowboys play Pittsburgh at home Sunday in a battle of 7-6 teams trying to keep playoff hopes alive. Bryant re-entered the game after sustaining the injury and caught a touchdown pass that pulled the Cowboys to 19-17 in the fourth quarter. Dallas won on a field goal by Dan Bailey on the final play. "I think adrenaline sometimes allows players to continue to play after they've had an injury," Garrett said. "He certainly made a big play in the ballgame, and I think that's a real tribute to his toughness and his love for the game." If Bryant ends up on injured reserve, he will be the fifth Dallas starter sidelined by a season-ending injury. The other four are defenders, and nickel cornerback Orlando Scandrick is out for the year with a hand injury. Nose tackle Jay Ratliff has missed seven games with ankle and groin injuries. Brent was set to make his fifth start in Ratliff's place against the Bengals, but police say he was speeding and drunk when the vehicle he was driving clipped a curb and flipped in the Dallas suburb of Irving early Saturday, hours before he was to be on the team flight to Cincinnati. Brown was found unresponsive at the scene and pronounced dead at a hospital. Garrett told the team about Brown's death on the plane just before takeoff. The Cowboys kept an empty locker for Brown in the visitor's locker room at Paul Brown Stadium, and Jason Hatcher raised Brown's No. 53 jersey over his head as he walked on the field after Bailey's winning kick. "I think it's the most emotional game that I've ever been a part of anywhere, player, coach," Garrett said Monday. "You're trying to place life and football in some kind of context together and it doesn't really fit and you don't really have a whole lot of time to kind of process it." Garrett said the Cowboys "absolutely" will carry Brown's death with them for the rest of the season and beyond. But they still have the postseason to pursue. Dallas is still a game behind Chicago and Seattle for the two wild-card spots in the NFC, and the New York Giants stayed a game ahead in the NFC East by beating New Orleans. "It was difficult for us to do it in Cincinnati, but it's just the reality of life," Garrett said. "We have to continue to move on. We have to honor Jerry. We have to help Josh any way that we can. But then we have to get back to work."